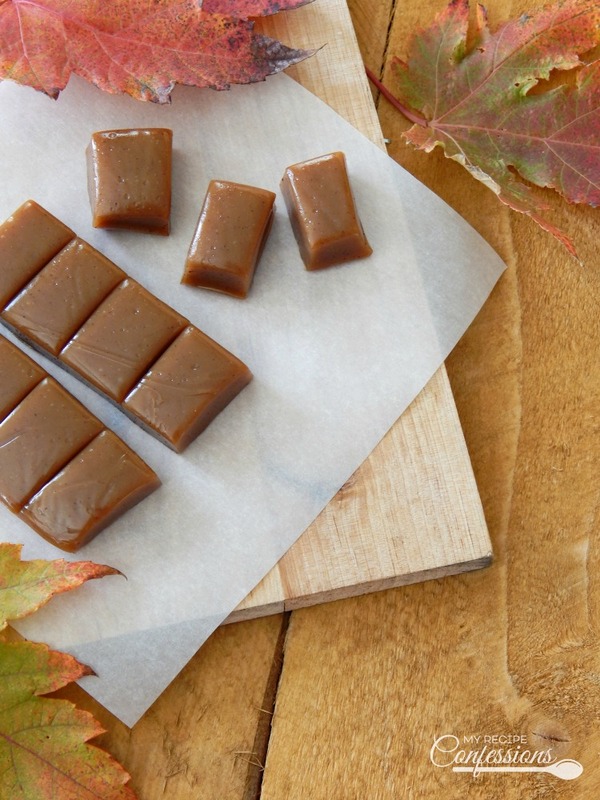 Pumpkin Spice Caramels and Fall go together like peanut butter and jelly, cookies, and cream, or even mac and cheese. I think you know what I mean. 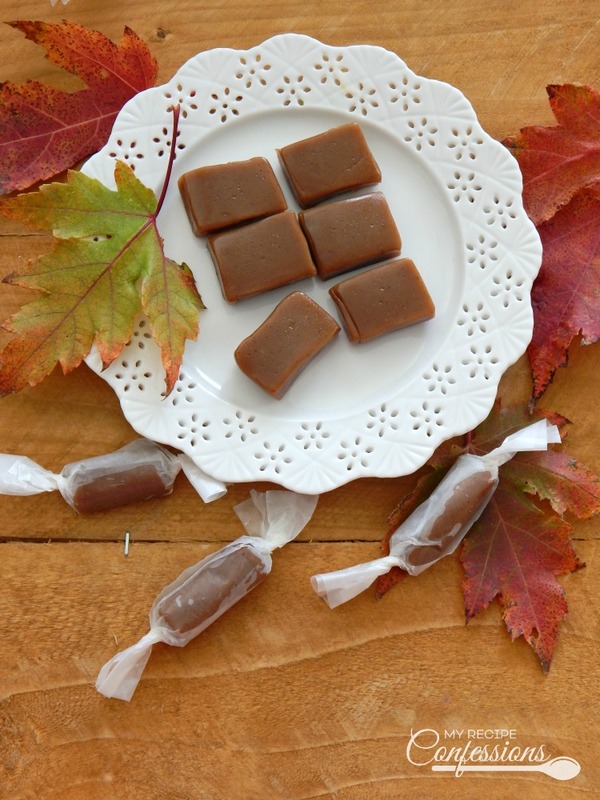 Fall just isn’t the same without some Pumpkin Spice Caramels! When I make caramel, I don’t like to use a candy thermometer. I feel like the candy never turns out quite right with it. I was taught by grandma to use the cold water method. While the caramel is cooking, I dip a teaspoon into the hot caramel and place it into a small bowl of cold water. If the caramel forms a soft ball it is ready. It should take about seven minutes of boiling for the caramel to reach the soft ball stage. Make sure to have all your ingredients measured out and ready to go. Once the caramel starts cooking, you have to work quickly or it will burn. Having everything ready before hand helps in the process. 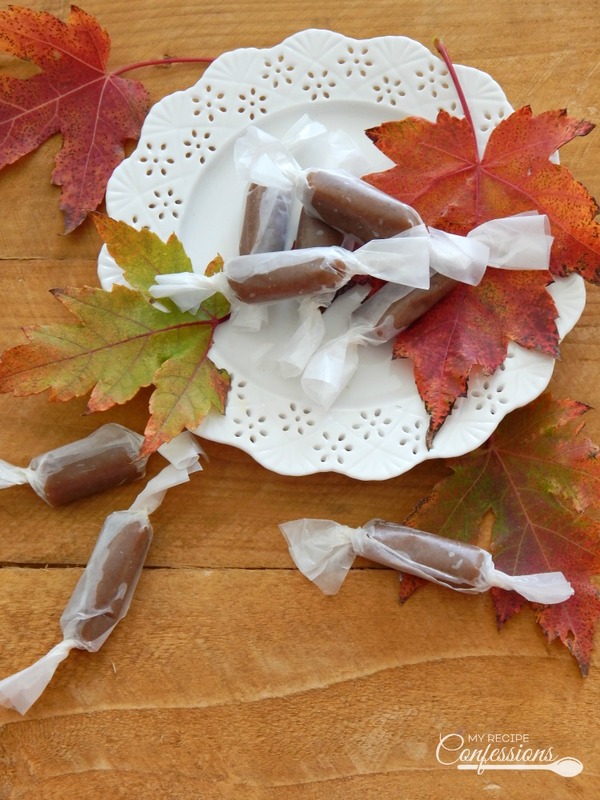 I can’t wait for you to enjoy your own batch of Pumpkin Spice Caramels! These caramels are so addicting. You may want to make them when you have a lot of people around to help you eat them. Check out my quick and easy pumpkin spice recipe. I prefer this recipe over the store bought pumpkin spice because the flavor is a lot more vibrant. Pour cold water into a small bowl. Place the bowl next to the stove with 2 to 3 spoons next to it. Measure all the ingredients and have them ready. Spray a 9×13 inch pan with baking spray. In a thick bottom sauce-pan over medium-high heat, melt the butter. Add the brown sugar, corn syrup, sweetened condensed milk, and salt to the melted butter. Stir until combined. Once the caramel comes to a full rolling boil, set the timer for 7 minutes and whisk it constantly. 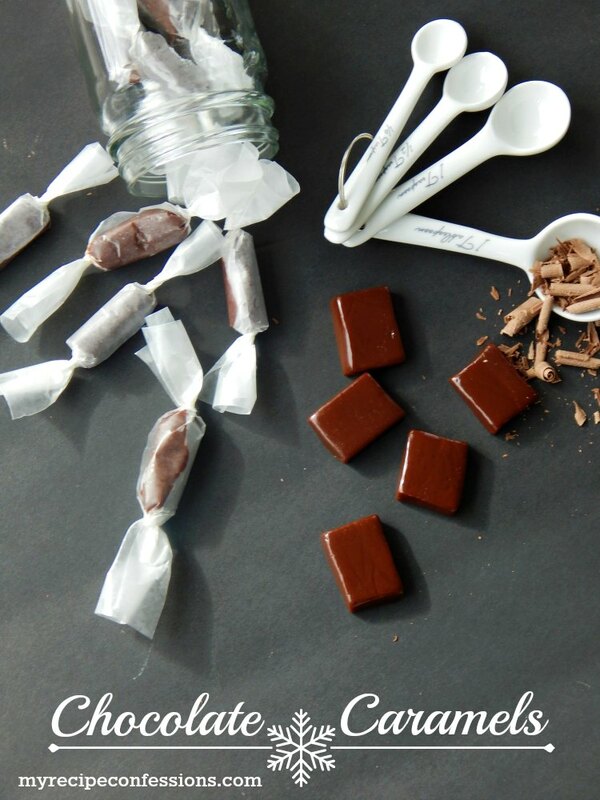 Check the caramel consistency by placing a spoon into the caramel and dip it immediately into the cold water. When the caramel forms a soft ball remove it from the heat, about 7 minutes. Immediately whisk in the vanilla, heavy cream, and pumpkin pie spice. Pour the hot caramel into the greased 9×13 inch pan. Do not scrape the caramel off the bottom of the pan! Once the caramel cools down, slightly place a strip of plastic wrap that has been sprayed with baking spray directly on top of the caramel. This will prevent the caramel from forming a skin on top. Allow the caramel to cool down completely. I like to let my caramel set up over night before I cut it. Cut the caramel into 1”x 1” strips. Wrap the caramel in 3”x 5” wax paper strips. Store the caramel in an air-tight container. You add the pumpkin pie spice at the end with the vanilla and heavy cream. I am sorry the recipe didn’t say that. I just fixed it. Oh yum! 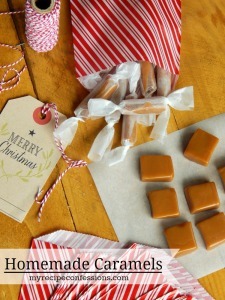 I love to make caramels for the holidays but never thought of making pumpkin spice caramels. I can’t wait to try this! 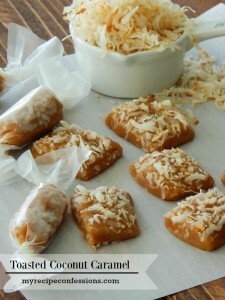 If you like caramels, than you are going to love these pumpkin spice caramels! Let me know what you think. Thanks for stopping by! Carrie seriously, these look perfect. I made caramels last year and they were so sticky 🙁 Going to try yours, yum!